From the fall of 1886 through June 1916 Albion College operated a Commercial Department, which was also known as the Business School. Albion College is located in Albion, Michigan, 100 miles west of Detroit. Founded in 1835, this Methodist-founded private four-year institution is well known throughout the country and is one of Michigan’s leading liberal arts colleges. The goal of the Commercial Department was to help students educate themselves about surviving in the business world. Courses included bookkeeping, penmanship, shorthand, and typewriting. The 1889-90 Albion College Yearbook states (pg. 42): "The benefits of a business education are becoming more apparent each year. The rapid increase in our population is causing a corresponding growth in our commercial transactions. This increased activity in business circles must necessarily open the way to many a young man for a successful entrance into the active duties of life. The first question which every thoughtful young person will ask is, ‘How may I best fit myself for success in life?’ The answer, educate yourself." This vocational emphasis did not sit well with some of the College establishment which was used to teaching the more "refined" traditional studies such as literature, philosophy, languages, mathematics, and sciences. The "step-child" Commercial Department did not receive a full blessing of the college faculty, and "enrollees in the Business College did not participate in the baccalaureate program," states author Fennimore (pg. 264, see bibliography). Despite this, the Commercial Department was a huge success, and its numbers swelled to over 80 full and part time students by the end of the 1880s. The Commercial Department at Albion College was semi-self-sufficient. The College only supplied the rooms, lights and heat on the first floor of the south half of the North Hall. The Department was responsible for its own materials, supplies, and equipment. The North Hall was erected in 1856, and has been used for a variety of college classes and programs through the years. Because the business school classes were held here, the building became known as the "Commercial Building" up to World War I. It is still standing today on the campus of Albion College and has been known as Vulgamore Hall since 1997. The department had to fund its operations and expenses including faculty from the tuition it collected. From all tuition funds collected by the Commercial Department, they got to keep seventy-five percent, while Albion College would reap twenty-five percent of the funds. Regular tuition covered all studies except typewriting and shorthand. The tuition rates for the 1889-90 school year was as follows: First term in advance: $20; second term: $17.50; Third term: $12.50. Besides the regular courses, there were special classes held to accommodate students from other departments at the college who wished to gain specific skills. They were per term: Bookkeeping, five hours a week for $5.00 or three hours at $4.00; Penmanship five hours a week at $3.00 or $2.50 for three hours; Commercial Arithmetic, five hours a week for $5.00; Commercial Law, three hours a week for $2.00; and Shorthand and Typewriting at $15.00 per term. Those taking the standard bookkeeping course in the Commercial Department would receive a supply kit containing all the mock forms that would have been used in the business world at the time. These included notes, drafts, receipts, checks, bill heads, shipping invoices, freight and shipping receipts, insurance policies, bills of exchange, bills of sale, statements, deeds, mortgages, leases, and merchandise cards. Each student was furnished with a beginning college currency cash capital of one thousand dollars. The Commercial Department course was divided into three terms totaling nine months. For the first term, a student would take his/her kit and lease a place of business and begin work. He/she would buy and sell from other student merchants using the various forms and college currency. The merchandise cards were given various values and were bought and sold according to the law of supply and demand. After becoming familiar with the process, the student would be promoted to the "Boot and Shoe" business which formed the second term of the course. He/she would then purchase items from the "Merchants’ Emporium" at wholesale prices, and then sell to jobbers. The student would then go through several trades such as Dry Goods, Groceries, Flour and Feed, Produce and Provisions, Commissions, Clothing, and General, becoming familiar with the basic operations of each and the forms used. Upon completing this portion of the course, students would advance to the third term which focused on office work. Each student was supplied with large office ledgers for the Transportation Office, Merchants’ Emporium, and the Bank. When the student completed this portion, he/she was given an examination covering the entire course work. A passing grade was 80%, and diplomas were subsequently awarded to those successfully completing the class. During the late 1890s the Commercial Department used the Baltimore, Maryland based "Sadler’s Bookkeeping Office Practice" kit as its "textbook." College currency was used which was deposited in the "college bank," and a pass book would also be issued. Various college currency notes were used in denominations of $5, $20, $50, $100, and $1,000. These were generic notes that came with the Sadler kits, and were used in schools across the country. Of special interest however is a set of notes used during the 1889-90 school year that is specific to Albion College. That year the Commercial Department printed its own college currency instead of just using pre-printed generic notes. These measure 174 x 75 mm. in size, and were issued in denominations of $1, $2, $5, and $10. No printer’s name is found on the notes. Due to their local nature however it is suspected that they were printed by the Albion Recorder (newspaper) Press, which produced numerous programs, booklets, and other materials using colored inks. The exact same schooner illustration which appears on the back of the notes also appears in Recorder advertisements in 1890 and 1891. Printed with blue ink on white paper, the face side states, "Commercial Department C. A. Head, Principal. Currency. Albion College, Albion, Mich. X Dollars." The two lower denominations utilize the words "One" and "Two" respectively to indicate the values, while the others are indicated by the Roman numerals "V" and "X." On the right is the image of a 12-point elk with mountains in the distance (There are neither elk nor mountains in Albion). On the left is the image of a man, presumably Professor Head, with a big head on this note. The ornamentation consists of flower petals and diamond-squares. The back is printed with light orange ink and contains a drawing of a schooner in the center, surrounded by numerous starbursts which make up the rest of the design. These notes are unlisted in the standard "College Currency" reference book by Schingoethe. They first appeared on the numismatic market in the late 1990s in a price list by dealer Larry Falater. The notes were part of a small hoard of six sets plus some loose individual notes discovered in the Petoskey, Michigan area. They presumably came from Bay View, a popular Methodist retreat facility where many Albion College professors and students spent their summers, and where summer classes were also held. The Albion notes were discovered in an 1895-dated box of generic notes (listed as Mavericks MAV-645 and MAV-655 in Schingoethe) of the "Sadler’s Bookeepers & Office Practice" kit. The box was rubber-stamped with the name of the then-principal of the school, Charles L. McClellan and stated, "To be used by students and returned to Chas. L. McClellan, From BUSINESS SCHOOL of ALBION COLLEGE, Albion, Mich." There are no printing, design, or text similarities between the Albion College notes and the generic Sadler notes. The Albion College currency is alluded to in Fennimore’s book on page 265, but unfortunately a photograph of an 1863 "Business College Bank" $1 college currency note from Ira Mayhew’s Commercial College, also in Albion, is erroneously pictured (Schingoethe MI-150-1). Mayhew had served as principal of the Wesleyan Seminary at Albion (the original name of Albion College) in 1853-54. His business school was separate from the College and operated in Albion from 1860 to 1869 before it was moved to Detroit. Professor Cary A. Head was principal of the Commercial Department at Albion College only during the 1889-90 school year. Little is known about him. He left to become superintendent of the West Michigan Business University and Normal School of Grand Rapids, and was succeeded by Charles McClellan beginning with the 1890-91 school year. Miss Maggie Miller served as instructor of Shorthand and Typewriting at the school during the 1889-90 school year. Who were the students that used the Albion College currency during the 1889-90 school year? They are listed in the 1889-90 Albion College Yearbook. The following local Albion natives were enrolled full time as commercial students: William E. Aiken, Charles L. Curtis, James P. Dearing, Harry Eastman, Myron B. Gilbert, Louise Houck, Fred J. Hubbard, Fay K. Kellogg, Rienzi Loud, Jr., Henry E. McGee, Nettie L. Ott, and William B. Wood. Those students enrolled full time from other communities were: Eva G. Anson of Marshalltown, Iowa; Wortley F. Armstrong of Kalamazoo, Michigan; Francis J. Bolitho of Ishpeming, Michigan; Ernest Carnes of Shepardsville, Michigan; Agnes M. Hall of Concord, Michigan; Charles Kellow of Ishpeming, Michigan; Arthur B. Linderman of Whitehall, Michigan; Ernest R. Proctor of Wallace, Illinois; John Quayle of Ishpeming, Michigan; Hugh E. Root of Mason, Michigan; Frank H. Roach of Sault Ste. Marie, Michigan; George H. Sayers of Grand Rapids, Michigan; and Ernest O. Selway and Philip Thorpe, both of Dillon, Montana. There were also other students who were exclusively enrolled in the shorthand/typing division of the Commercial Department. 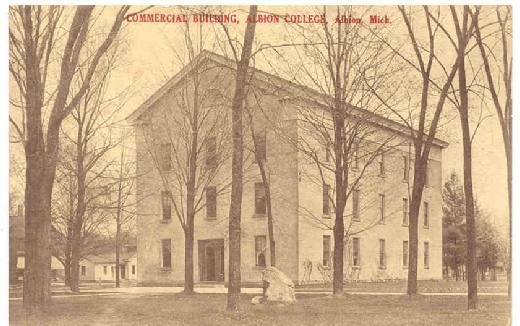 The Commercial Department was closed in June 1916, as Albion College re-focused its emphasis on the liberal arts. Author Fennimore laments (pg. 390): "With courses like bookkeeping, shorthand and typing, the School of Business was the most vulnerable. This was to be expected, since the faculty consisted largely of traditionalists who had always held reservations about the propriety of offering vocational courses on a liberal arts campus. Even more, the Commercial Department occupied an ill-defined middle ground which borrowed parts of its operation from Albion College and supplied others itself." Thus the Commercial Department was discontinued after being in existence for thirty years. 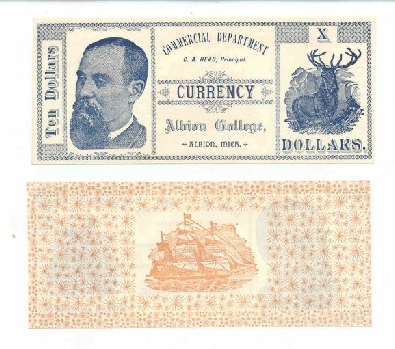 The 1889-90 Albion College currency however, is a reminder for collectors of the business college days of one of Michigan’s well-known private institutions. Special thanks to Albion College archivist Jennifer Thomas and numismatic dealer Larry Falater for their help and input in the preparation of this article. Albion’s Banks and Bankers, Albion Historical Society, 1985. Albion College Pleiad, June 1890, and other issues. Falater, Larry, "New Discovery. Previously Unlisted Albion College Currency," Price list. Fennimore, Keith J., The Albion College Sesquicentennial History: 1835-1985, Albion College, 1985. Schingoethe, Herb and Schingoethe, Martha, (Neil Shafer, editor), College Currency: Money for Business Training, BNR Press, 1993.